From the opening tape hiss, cheesy thunder track, and hazy synth I had a feeling that this was going to be a special release, however unfortunately obscure it seems destined to be. The unheralded nature of this release is a shame though, being not only the (probably) last recordings of David “Blackmoon” Parland we will ever hear again, but also one that was apparently recorded back in 1994, the same year as the self-titled Dark Funeral EP. These two tracks, played entirely by Parland, are something more than an afterthought or aside to Dark Funeral, making one wonder why exactly they were kept from the public for so long. Still, they are available now and we finally have access to this 9 minutes of black metal history that fell through the cracks. First off, forget for a moment that this was the man behind The Nocturnal Silence and The Secrets of the Black Arts. Though the riffs here are unmistakably those of David Parland, this small demo holds its own style relative to the satanic death metal of Necrophobic and the tremolo blasts of Dark Funeral. 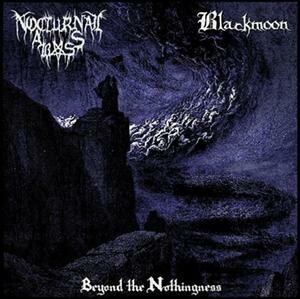 What Blackmoon brings us is a much slower and more ponderous journey through the darkness: mid-paced Bathory styled riffs, spectral arpeggios, Storm of the Light’s Bane cave drums, subtle old-school synths… It’s all far more restrained than on the more extreme projects that Parland was otherwise often involved in. Parland’s vocals are extremely strong and appropriate to the overall sound; a throaty and cold scream howling over the bleak landscapes conjured by the magic of Blackmoon. Admittedly, there’s nothing that’s really incredible about this material; the songwriting and riffcraft are strong, but they don’t stand up to the classics of the time period, and the short 9 minutes leaves me wishing that their could have been a lot more. Taken in context though, these complaints aren’t all that valid for what was only a demo at the time period. If this demo had been released by a new band today I expect that the underground would easily lap it up. As it stands, a lack of advertisement, and perhaps awareness of the musical talents of the late Parland, seem to have confined this one to be buried by time and dust. ~ by jakemoran on May 1, 2013. This entry was posted on May 1, 2013 at 7:04 pm and is filed under ALL REVIEWS, B-reviews.You can follow any responses to this entry through the RSS 2.0 feed.You can leave a response, or trackback from your own site.